The recipes in this post is likely old hat to most, but I am sharing it anyway because nature gave us the most beautiful surprise this morning! It’s an eggy rainbow! Have you ever tried natural, eco-friendly methods of dying eggs? Did you know this was even possible? It is and it’s fairly simple to do. 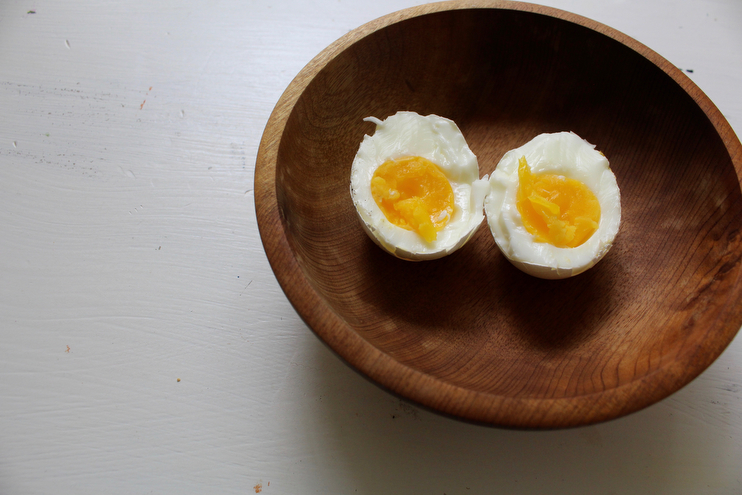 If you have an hour this afternoon give it a whirl and you’ll have yummy soft-boiled eggs to eat this holiday weekend. The first time I saw this done was years ago when Pinterest was staring to become a thing, which it still is in my book, and I was super intrigued. Like so many other things, I never assumed that there was an alternative way of going about this craft. Apparently, pre-packaged commercially made artificial dyes is an American thing? Who would have guessed??? Come ON America. I feel like one (sometimes even two) months before a new holiday comes out, the holiday is almost entirely ruined by commercialism with the push to buy this, get that, and spend far too much whereupon we somehow lose a bit of the holiday magic along the way. For me, and I am sure for you too, the beauty of holidays lies in the sacred traditions and time we carve out to spend with those we love. It’s about shaping values and parts of ourselves in the little rituals that come around only once a year. With this in mind, I this it’s pretty nifty that you don’t have to run to the store to get a factory-made kit to make an egg rainbow this Easter. You can open a spice cabinet, snip from the garden, sift through your tea tins, or rummage through the vegetable drawers to create a lovely color pallet that is delicate and Eastery and wonderful because of the connections you get to make with nature alongside the young ones you are creating with. Easter is not about all about baskets and eggs hunts in our house. It’s about Jesus and so much more. However, baskets and eggs and Sunday brunch and all that jazz are absolutely par for the course because these things do knit us together in really special ways as family. Let’s talk about the process. Showing the kids that purple cabbage leaves can turn eggs blue was magic to them. And those beets mommy likes to put on her salad, well they made the most vibrant shade of hot pink and Stella was so excited! She even ate a leftover steamed beet or two as we dipped and dunked. I dug in the spice cabinet and our tea bin to make gold and jade and violet, which ended up creating my favorite colors of the bunch. And then in lieu of composting or juicing onion skins and wheatgrass, we used those to make soft green and red browns. So neat! What’s so great about this nature-based craft is that you can use your imagination and try new things to make new colors with your young ones. We mixed many of our base colors (red/blue/yellow) to make new ones and that was exciting. Let your little ones choose a spice and go from there. Snip some grass or spring blooms and have them add them to the pot. You may just discover a new color blend to share with others! Making the shift from supporting a rushed commercial-based holiday, to nurturing a slower, more wholesome kind of tradition does not have to be overly-complicated. It does involve a bit more chopping and stirring, but in all, it’s a much more nurturing experience I think! 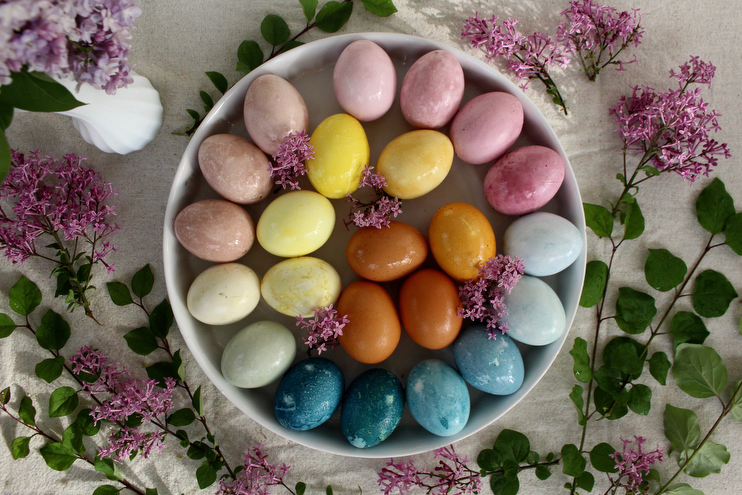 Below are some simple steps you can follow to make nature-based colors for your Easter eggs this year. 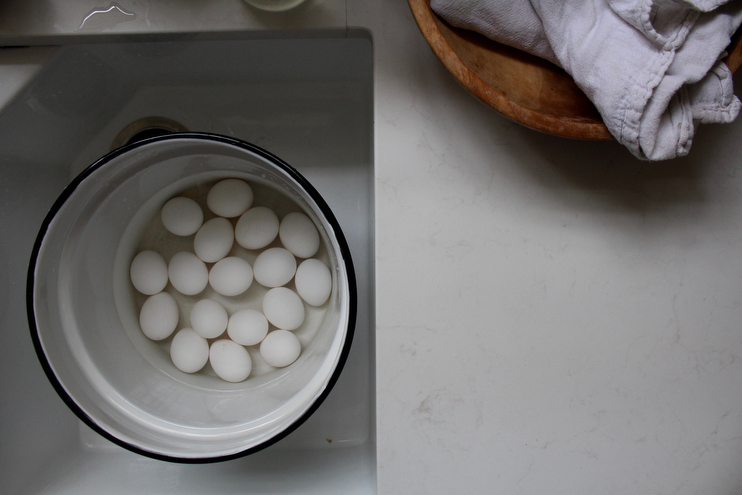 Gently place the eggs in a single layer in the bottom of a large pot or saucepan and cover with 1-2 inches of water. Add a generous pinch of salt + a splash of distilled white vinegar to the pot for good measure. I don’t really know why I do this step, but I learned it somewhere down the road and continue to do out of habit. I believe it was intended to make peeling easier? Who knows if it actually works. Once the water is boiling, turn off the heat and let the eggs sit on the burner with a lid covering the pot for 8-9 minutes to get a semi-soft boiled egg. We don’t like our eggs fully hard-boiled, but if you do, keep them steaming for 12-13 minutes. When the timer goes off, put the eggs in an ice bath to stop the cooking process and once they cool you are ready to dye. I like using white eggs for this craft so the colors show up more intensely, but light brown will make lovely colors as well. Add roughly 1 quart of water + 2 tablespoons of distilled white vinegar to various pots. Make sure the water covers the ingredient, and if you need more than 1 quart to do so, proportionally increase the amount of vinegar as well. Once brought to a boil, lower the heat to a simmer for 20-30 minutes. Strain dye into a bowl and either save or compost leftovers. Place however many eggs you want in glass jars with the dye + 1-2 tablespoons of distilled white vinegar. Soak for as long as you’d like in the fridge. An overnight dip will result in more vibrant colors. I soaked our eggs overnight for about 12 hours total. Once you’ve reached your desired color intensity, wash off the excess dye or rub with gently with a towel. Aren’t they beautiful? We are going to eat this rainbow on Easter with smoked salmon on bagels before our egg hunt! There are so many nature-based ways to dye eggs and other items out there, what ones have you tried? I really want to find a way to make green more vibrant next year. Any tips? Hope you give this a try and have so much fun this Easter! I love these natural dye options! They turned out so pretty!